A table standing luminaire for direct task, low voltage, halogen lighting. Tizio is part of the permanent design collection in several musueums such as the Museum of Modern Art and the Metropolitan Museum. In stock on November 24, 2013: 1 White Tizio Classic. Free shipping within the continental US. Order online or call us anytime, 1-877-247-2250 (toll-free). Visa and MasterCard accepted. 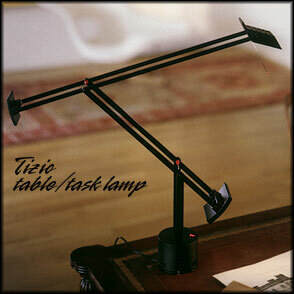 Tizio: The classic, with parallel head rotation and two intensity switch. 50W halogen bulb. Black or white $335.75. Silver grey $361.25. Black LED $501.50. Tizio 35: 20% smaller than the classic. 35W halogen bulb. Available in black $272. White or silver grey $310.25. Tizio Micro: The smallest of the Tizio series. 40% smaller than the classic. 20W halogen bulb. Available in black or white $250.75. Polished aluminum $297.50. Tizio Plus: State of the art version of the classic with added features of parallel and transversal head rotation and dimmer. Black $420.75.